There are several mystery pieces in The Queen's vault, jewels which have been worn in public only a couple of times and come without much to indicate a potential provenance. Here's one: a demi-parure of a matching necklace and bracelet, the necklace featuring vertical bars of diamonds creating a continuous sparkling cuff of diamonds, in a yellow gold setting. Appearances of the diamond cuff set were clustered in the 1990s, including a visit to Berlin in 1992 and the 1999 Royal Variety Performance. The set may have been a gift during her reign, based on the modern style and the fact that the choker style of necklace is not one that The Queen wears often (this, however, is just my own speculation). 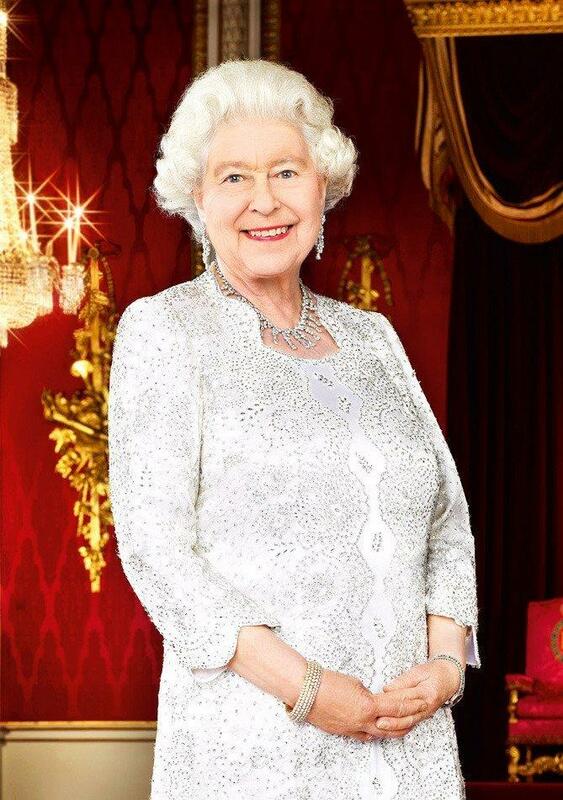 This set hasn't been used much by The Queen, and given that different style necklace, I'm not surprised. The Queen with the bracelet. Her earrings look to be from the Diamond Chandelier Drop Demi-Parure, and her necklace is the DiamondPear-Shaped Pendant Fringe. The Countess of Wessex borrowed the Diamond and Gold Cuff Necklace from The Queen in December 2016, when attending the Golden Hockey Ball. It is another in a long line of loaned pieces that have been steadily appearing on both The Countess and on The Duchess of Cambridge. One other note on this set: Diana, Princess of Wales had a necklace and earring set that resembled the shape of the Diamond and Gold Cuff Necklace. These necklaces share similarities, but are different; Diana's may have had darker elements in addition to the diamond (real or faux) elements. The Princess of Wales' use of such a set does speak to the time period in which designs like this were fashionable, however, and perhaps offers a clue as to when The Queen's necklace was created. Thanks to commenters for reminding me of the later bracelet appearance and of Diana's similar necklace, which is cataloged at the Diana's Jewels site.